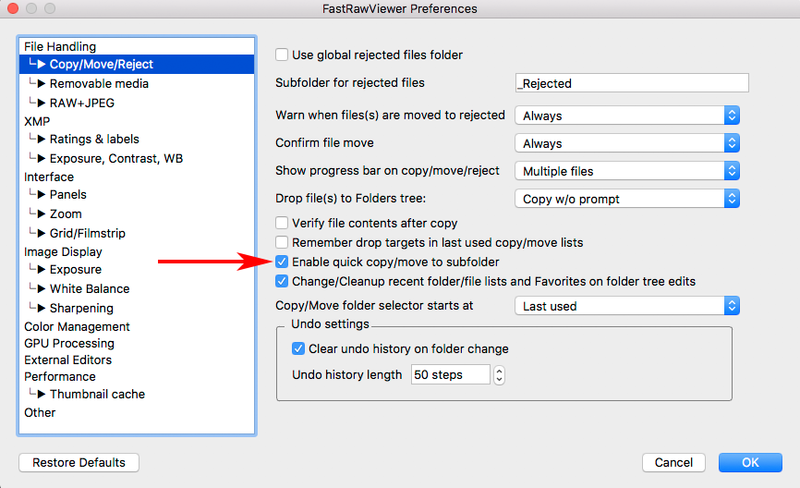 To enable / disable this feature, please use Preferences - File Handling - Copy/Move/Reject - "Enable quick copy/move to subfolder". In this beta version it is enabled by default, but in the release version this mode will most likely be set to off. The [New Subfolder] element will also be available through hotkeys: Alt-M (for Move) and Alt-C (for Copy). If this [New Subfolder] element is selected, you will be asked to enter the name for the subfolder in the current folder. 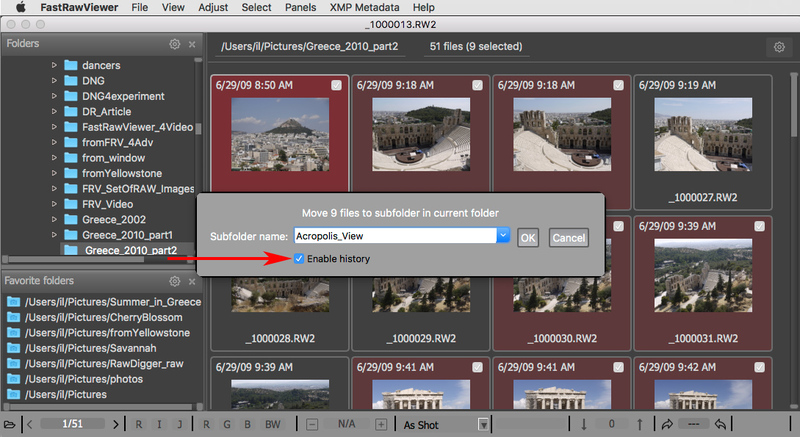 The dialog, requesting the name for a subfolder, contains an"Enable history" checkbox (please see the arrow on the picture above). If Enable History is checked, the names of the subfolders used in the current session will be recorded. The history can be accessed by pressing the "Arrow down" key. The most relevant name will be selected when you start typing. This history is not saved between sessions. 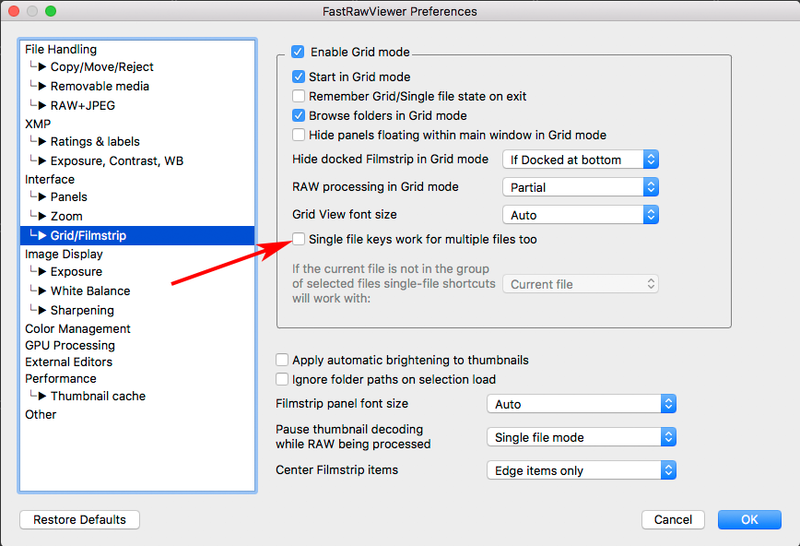 If the mode Preferences - Grid/Filmstrip - "Single file keys work for multiple files too" is off, the shortcuts and menu items for one file and a group of files will be different; there is no default shortcut for the operations with a group of files. However if this mode is on, the same shortcuts and a menu items will work both for a single file and a group of selected files, according to the settings. Windows: new hiddend setting Bottom bar font in pixels, use BottomBarFontPixels.reg/NoUseBottomBarFontPixels.reg scripts to change from default. This feature is intended for dual-monitor systems with very different resolution (e.g. 4k and FullHD), when OS is unable to deliver resolution change data to application correctly (some versions of Win10 in specific cases). Most users do not need this. 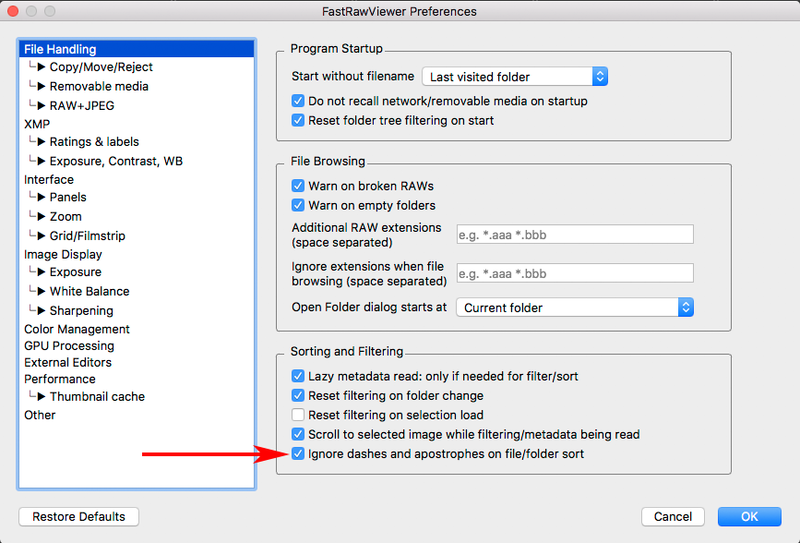 New preferences setting File Handling - Sorting and Filtering - Ignore dashes and apostrophes on file/folder sort. Controls file/folders sort order if punctuation symbols are used in names. Mac: default is OFF, to match both Finder and Adobe Lr sort orders. Filmstrip panel allowed to Right dock area. New method of Grid view thumbnail margin calculations to better handle folders with small file count. 5th (purple) custom label was not read in XMP file in some cases. If thumbnail cache size is too small to keep all thumbnails in current folder, file metadata cache may expire too during thumbnail cache cleanup.